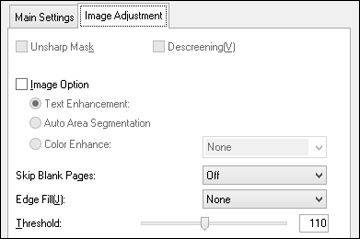 You can select these Image Adjustments options in Epson Scan Office Mode. Not all adjustment settings may be available, depending on other settings you have chosen. Note: Select the Image Option checkbox if you need to set any of the grayed-out image adjustments beneath the checkbox. Sharpens the appearance of letters in text documents. Makes grayscale images clearer and text recognition more accurate by separating the text from the graphics. Enhances the red, green, or blue shades in the scanned image. Ensures that your product does not scan pages that contain no text or images. Corrects shadowing around the edges of the image by filling the shadows with the color you select. Adjusts the overall lightness and darkness of the scanned image. Adjusts the difference between the light and dark areas of the overall scanned image. Adjusts the level at which black areas in text and line art are delineated, improving text recognition in OCR (Optical Character Recognition) programs.